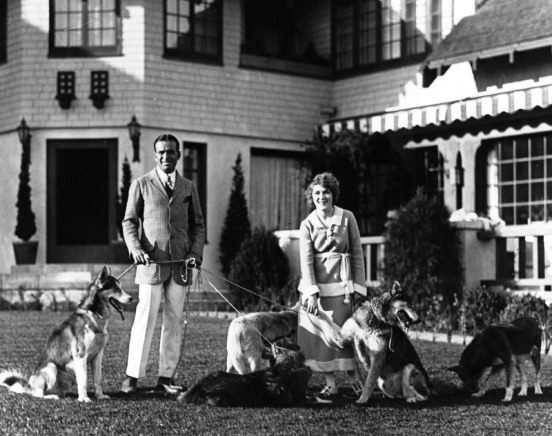 It was the historic estate bought in 1919 by silent film actor, Douglas Fairbanks for his new bride, Mary Pickford, known to everyone as “America’s Sweetheart.” Pickfair had four stories, 25 rooms, stables and tennis courts. Doug and Mary lived there as husband and wife for the next seventeen years until their divorce in 1936. During that time they entertained heads of state, royalty and Hollywood royalty. Some of the world celebrities that visited Pickfair included George Bernard Shaw, Albert Einstein, Helen Keller, H.G. Wells, Lord Mountbatten, Amelia Earhart, F. Scott Fitzgerald, Noel Coward, President Franklin D. Roosevelt and his wife Eleanor, Charles Lindbergh, Sir Arthur Conan Doyle, Thomas Edison, and The King and Queen of Siam. Pickford kept the house after the divorce and lived there with her third husband, actor Charles “Buddy” Rogers until her death in 1979. Afterward, the house stood vacant for a few years until it was sold to Los Angeles Lakers owner, Jerry Buss, who continued to update and care for the historic estate. On a recent episode of the Biography Channel’s, Celebrity Ghost Stories, Zadora changed her story and claimed the real reason that Pickfair was destroyed was because the house was haunted. Zadora said in the interview that as soon as she and her family moved into the house, a female ghost appeared to her children at night and would frighten them. Within time, she too, saw the ghost—a woman dressed in 1920s attire who was always laughing (the ghost evidently watched her performance in The Lonely Lady). Zadora says that she did her own research (really?) and determined that the ghost was the mistress of Douglas Fairbanks, and the woman actually died on the estate. She doesn’t name the woman, say how the woman died or how she came to this conclusion. Zadora brought in an exorcist but that didn’t help and ghost continued to visit her. She decided the only thing to do was to level the house. It’s not like people were dropping like flies at Pickfair so shouldn’t it be fairly easy to identify this laughing ghost? I’m not an expert on Pickfair but I don’t recall anyone dying there (if someone knows the answer, please post it here), not even Pickford, who suffered a cerebral hemorrhage there but died later at Santa Monica Hospital. Wouldn’t a death at Pickfair have made the newspapers unless it was covered-up by Fairbanks and Pickford? If so, how did Pia Zadora find out the “truth” in her so-called “research?” Once again, she doesn’t say how she came by that information in the interview, but producers of the show recreate a scene of her reading through books and paper.